Mainsail 257 - Act fast, for best spring availability. Mainsail 257 is professionally managed by ResortQuest by Wyndham Vacation Rentals. This beautiful condominium is actually two condominiums put together and has the feel of a spacious penthouse with 2164 square feet of elegance! This fine condo offers four bedrooms and two separate balconies with amazing Gulf views from the fifth floor of Mainsail Building II, which is one of the two front buildings right by the shores of the Gulf of Mexico. This unit has incredibly nice upgrades including fine flooring, customized appliances, Corian counters, and fine furnishings. The kitchen has all the upscale finishes and is fully stocked to prepare meals. You will find two separate living areas for sanctuary in this fine unit were you will enjoy fine furnishings which include two queen sofa sleepers, two occasional chairs, another sofa and loveseat, as well as a very nice flat screen TV. Access to one of two balconies is off the living room and the other is accessible from one of the two master bedrooms. There is a dining table for six as well as barstools at the breakfast bar for plenty of dining space. There is a very nice wet bar stocked with extra glasses conveniently located by the dining area. The two master bedrooms feature king beds. The first guest bedroom has a full size bed and the second guest bedroom has two twin beds. There are three full bathrooms with shower/tub combinations. Each bedroom plus the living room have nice quality flat screen TVs and DVD players. You will also enjoy the convenience of your own stackable washer and dryer during your stay. Book this luxurious and spacious four bedroom unit today! With all of the amenities that this wonderful property has to offer, it is some where you will want to stay every year! 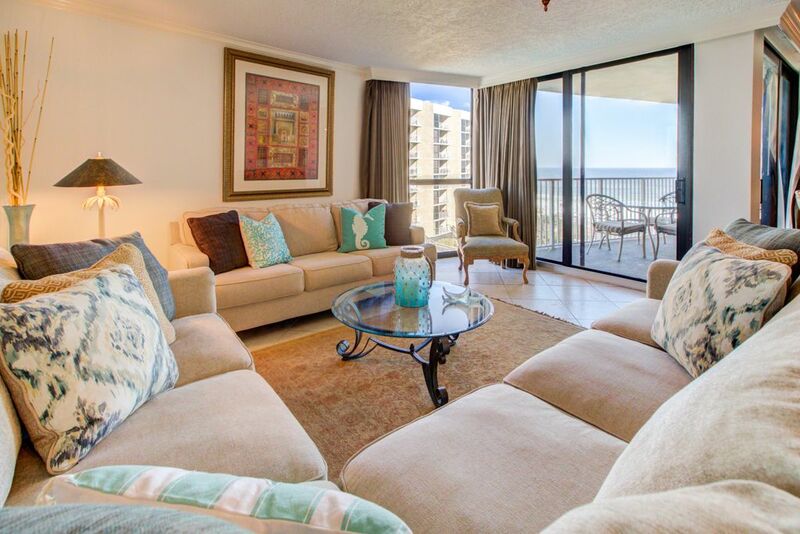 Make your next beach memories in comfort and style at Mainsail Unit 257!!! Perfect size for family of 10.. Great Ocean view.! The condo was the perfect size for our family of 10.. Wonderful view of the Gulf..
We are so happy to hear you enjoyed your stay at Mainsail! Your guest experience is our top priority. Thank you for taking the time to write a review about your vacation after you returned home. We hope you are able visit again soon. Gorgeous views! Plenty of space! Beautiful condo! We are so happy to hear you enjoyed your stay at Mainssail! Your guest experience is our top priority. Thank you for taking the time to write a review about your vacation after you returned home. We hope you are able visit again soon. Beautiful condo. Nice new appliances and kitchen, and plenty of room for a big family with the 4 bedrooms.